The most common criticism of painting in pastel is the problem of dust. This can be a concern if you have breathing problems or are sensitive to dust . I am asthmatic myself. However there are a number of methods of reducing the dust considerably. 1. Always work with the painting vertical on an easel with a right angled channel, (cardboard or plastic) under the drawing board. This allows the pastel dust to drift down into the channel and you do not have to blow away the excess pastel as you would if the painting was at a shallower angle. If you don’t like standing you can use a desk easel, but keep the painting vertical. You can make an angled channel with a length of mountboard. At the end of a painting session I rarely have more than a quarter of a teaspoon of dust in the channel. 2. Keep a dry flannel in your hands while you are working. This serves two purposes; it keeps your hands relatively clean and you can clean any grubby sticks as you work so that you can identify the colours easier. 3. Work on fine sandpaper; the abrasive quality of the surface grips the pastel and produces less dust than working on paper. Sandpaper also encourages you to work ‘thin’, i.e. use fewer layers of pastel. I find the colours are more vibrant on sandpaper and there is no need to build up layers to get depth of colour. You will notice in the photograph there is also an old towel on the floor, this also absorbs any dust and prevents dropped pastels from breaking. The towel on the table helps to keep the pastel sticks clean. 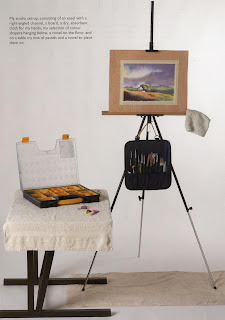 The tools in the holder hanging from the easel include colour shapers for blending, brushes for removing mistakes and palettes knives for creating the spatter effect (more on that in another post) etc. This entry was posted in Jenny Keal Blog, painting in pastel, pan pastel, pastel, pastel dust by Jenny Keal. Bookmark the permalink.